Come meet Equine Assisted Therapist and Spiritual Counselor Alecz Adams and learn about Animal Assisted Therapy, Altered State work, Buddhism, Energy Work and Shamanism, as they apply to Healing with Animals. 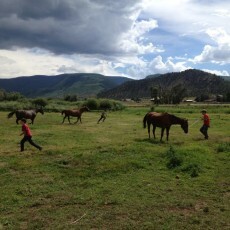 This class also prepares individuals to participate in Adams’ Vision Horse Meditation this weekend, which is a type of Altered State work in which the class will embark on a short mental journey, in which each person will have the opportunity to viscerally experience what a particular change in their life will feel like. Alecz Adams is an Equine Assisted Therapist, a DH Method Practioner, a Certified Hypnotherapist, and a Spiritual Counselor. She has been teaching the Healing Arts to people internationally since 2004. The class will be held at the Weekend of Healing, at 34520 Hwy 6, C11, in Edwards, CO. This is above the Thrifty Store, and next to Alpine Meadows Vet Clinic. The class is FREE, and donations are accepted. To register for the class, or any activities during the Weekend, please call (970) 376-6660.